First and foremost I’d like to give all glory to GOD for giving me the opportunities,family, vfriends , #LonVMUG crew, colleagues, mentors, fellow defenders and the abilities to be able to attempt (twice) and now achieve this. I’m still in utter shock and have read the email almost fifty times already to make sure I haven’t misread it somehow. I received the email at 7:50 GMT and with my heart in my throat opened it and saw the words congratulations and 205 and shouted out until my throat was coarse. 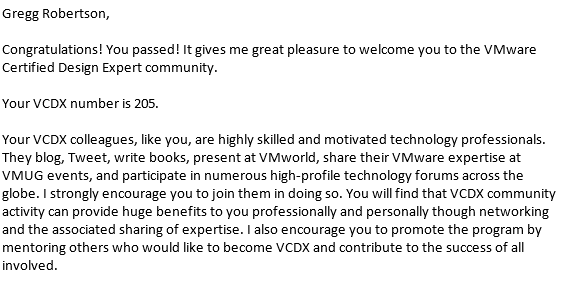 I promised Mark Brookfield I would allow him to do a VCDX Spotlight on me so below is more a thanks and also an encouragement for those who think it’s impossible to achieve. 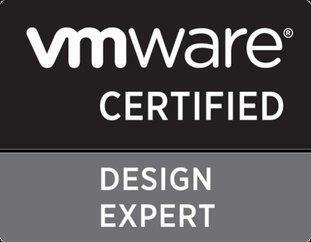 It’s never too early to start aiming and preparing for the VCDX. My design was an enhanced (learnt how to make it better) real world design I did at my first gig as a technical consultant almost four years ago. Make plans for when you want to submit and keep to it. I’ve been part of a number of really great study groups which then whittled down to a core few just before defences and the benefit from them is amazing. Both Ray Heffer and Hugo Phan have done brilliant postings around making a plan and also not using excuses of why you cant do it. Make sure you also learn T skills. This is one of the major reasons I failed my first attempt as I just didn’t have the t skills around the supporting technologies and was more a VMware SME than an Architect who does VMware designs. Rene van den Bedem has a brilliant list (the study plan ones in particular I am referring to here) which I used to learn everything as well as my own VCDX Round 2 list. I’ve got a lot of feedback where people say I went overboard in my preparations and people have passed after doing a design in forty hours. If you are like that and can do it in forty hours then hats off to you but I wanted to use the process to force myself to learn new things and so for my second attempt left nothing in the tank. Don’t leave it too late. I did this with my first submission where I left too much to do near the end and even though I managed to submit and get a defence invite I was so burnt out that I didn’t keep the momentum going after submitting and then just couldn’t find enough time to join my study group before the defence. If you have a good plan and schedule you can find time to relax with the family and learn, you just need to work out realistic times to do it. Like Ray says in his posting I too have been on a project away from home (in Rotterdam) and even though it was painful to force myself to do it I would read and study on the plane and train and airport back and forth each week. I know one of my mentors Larus Hjartarson took the bus each day to work so he could read and go over his quizlet questions. Do you want it more than X? This was a massive one that stayed in my head for my whole second attempt and links back to the past two points as well. Each day when I remembered I would watch the following two videos and really listen to the words https://youtu.be/scr2PrcDxEo and https://youtu.be/mgmVOuLgFB0. Each time I wanted to go for a drink with friends or when I wanted to go watch a tv program I would ask myself how bad do I want to be a VCDX and become better? Now not eating or drinking is a level too far and not advisable but being willing to sacrifice to attain what you want is very applicable. The second video was more about getting myself out of my pity party around my first failure and getting back into the ring. I do think you need to take a break right after as you don’t want to burn out but as they say in the video “Pain is temporary……it will subside, if you quit however the pain will last forever”. 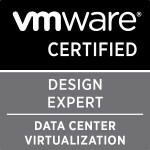 I didn’t want to be a person who failed once and never tried again, now I know some people have done this for the VCDX and everyone has their own reasons and I certainly don’t mean my situation applies to everyone but I knew I needed to go again. Learn on the job. Ray mentions this partly in his posting but as obvious as it sounds I didn’t utilise my time in my day job surrounded by smart people to learn off them and try apply that to the VCDX. I’m very fortunate to have been on projects with some extremely clever people but I never tried to absorb their knowledge like I have in the past year. I was weak in storage and networking after my last defence and so i spent loads of time with those SME’s on my current project learning and asking them questions. Also learning soft skills like customer presentations from colleagues has had a massive impact on my confidence. You belong in there. Last time I defended I walked into the defence like I was an unworthy worm in front of super stars. Now don’t get me wrong the guys on your panel are smart guys but they are also your peers and going in there with the mindset that it is a number of your peers who are interested in your design and want to learn how you did certain things and why made me much more confident and calm when I was grilled by the panel. This partly comes down also to my previous point about working with super smart people who are your peers. If you feel you don’t have these kinds of peers around you then maybe it’s time for a new job or role or more responsibility? Never stop learning. It’s amazing to me how much I learnt about my vSphere 5.0 design from my vRA 6.1 design that I’ve been doing for my current customer. Very much like the point about learning on the job, I asked VCDX like questions to my customer and from seeing how certain thing worked I knew how to not only better my old design but also the reasons not only why I chose something but why I didnt choose the others. Now it’s time for me to have a bit of a break. I am contemplating submitting for my double in the future especially seeing as I’ve been doing cloud work as VMware PSO for the last few years. Lastly there are just too many people to thank for their advice, help, brutal honesty and support. Also I would like to thank the panelists who don’t get much thanks for the work they do in their own time to keep the program going. I promised myself I would be a mentor when I passed and I am going to keep to that (not that I’ve bene asked to be a panelists tbh) . Congrats Gregg! Great write up, I got butterflies reading that. Well done Gregg, the hard work has paid off!